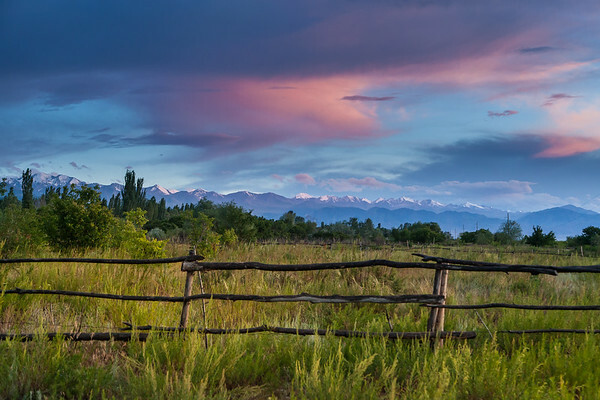 Sunset over the mountains near lake Issyk-Kul. Landscape taken from a moving car, as we were crossing the country from north to south. Statue of the legendary hero Manas fighting the dragon on a horse. 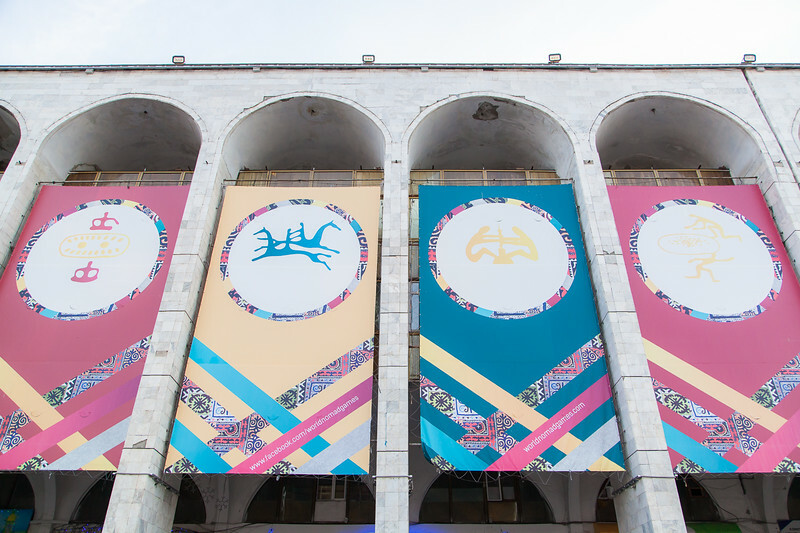 The “Epic of Manas", the classic centerpiece of Kyrgyz literature, is a traditional epic poem dating to the 18th century but claimed by the Kyrgyz people to be much older. The epic poem consists of approximately 500,000 lines, being one of the longest epic poem in History. 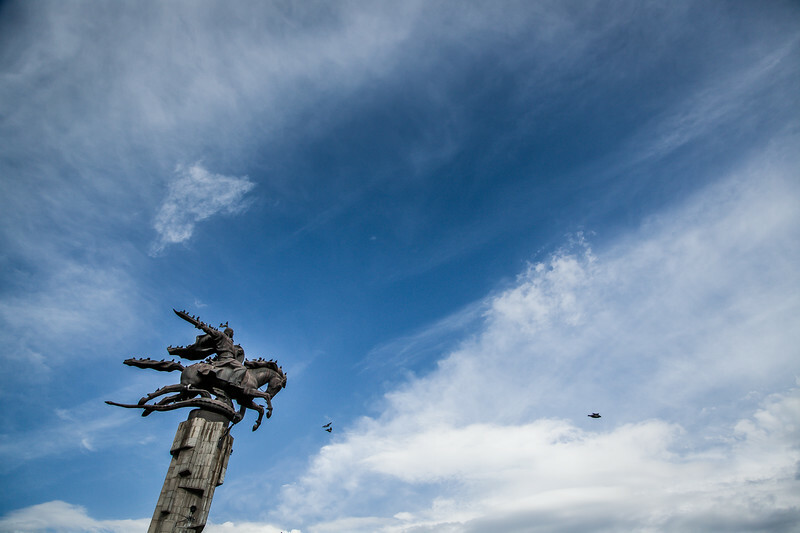 Statue of the legendary hero Manas fighting the dragon on a horse. 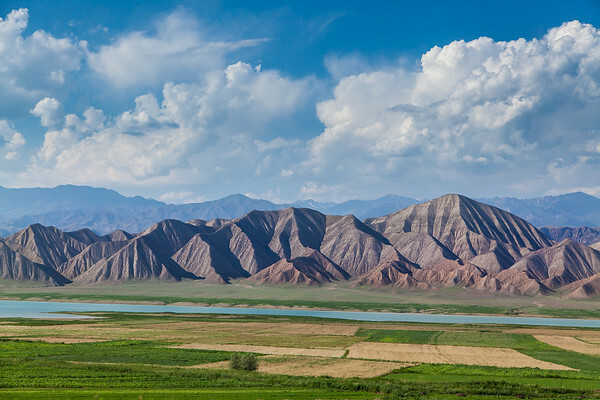 The “Epic of Manas” is the classic centerpiece of Kyrgyz literature, and its influence spans to the present. For example the main international airport of Kyrgyzstan, Manas International Airport in Bishkek, was named after the epic. 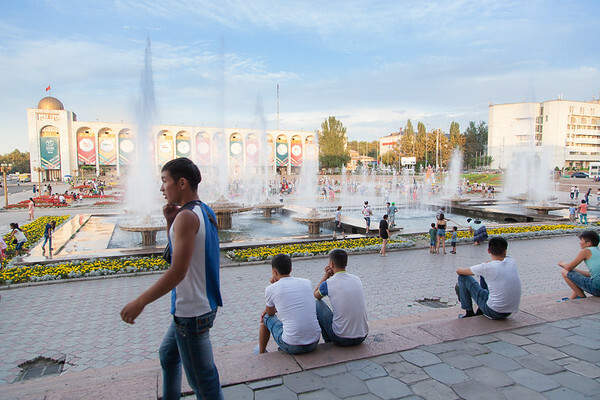 Ala-Too Square is the main square in Bishkek, Kyrgyzstan. 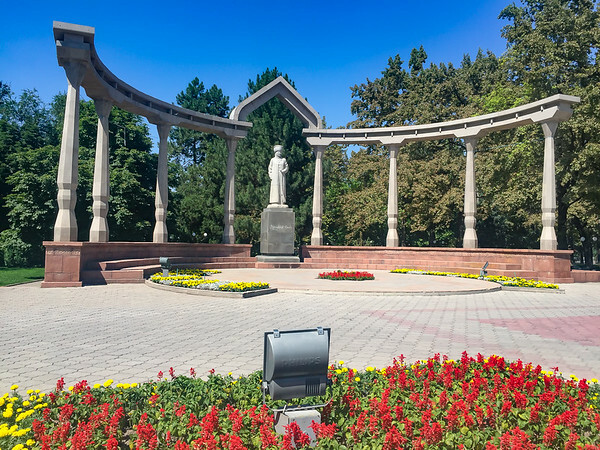 The square was built in 1984 to celebrate the 60th anniversary of the Kirghiz Soviet Socialist Republic, at which time a massive statue of Lenin was placed in the square's center. The statue of Lenin was moved in 2003 to a smaller square in the city, and a new statue called Erkindik (Freedom) was installed in its place. Later in 2011 it was replaced by statue of Manas, to celebrate the 20th anniversary of Kyrgyzstan's independence. On March 24, 2005, the Ala-Too square was the site of the largest anti-government protest of Kyrgyzstan's Tulip Revolution. After several weeks of unrest throughout the country, over 15,000 people gathered early in the afternoon to protest the results of the 2005 parliamentary elections. Two people were killed and over 100 wounded when the protesters clashed with government officials. However, the protesters soon took control of the square, and stormed the White House, forcing Askar Akayev, Kyrgyzstan's first president, to flee the country and later resign from office. 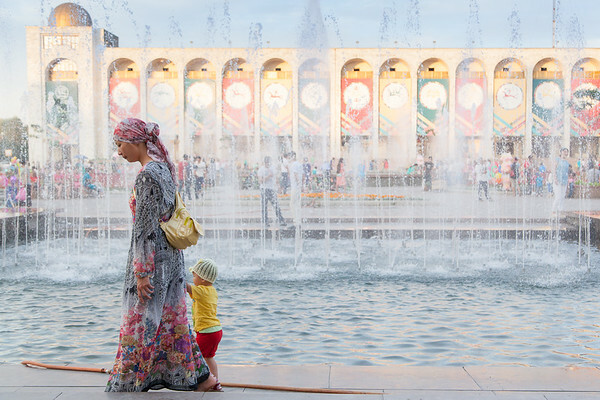 Ala-Too Square serves today as a place for state events and celebrations, and on a normal day is flooded with Kyrgyz tourists taking picture, couples having a walk, and kids running around. “We are from Kochkor village. This is our first time in Bishkek. We came from Kochkor to pass the exams to get into University”. Boys at Ala-Too, main square in Bishkek, capital city of Kyrgyzstan. Ala-Too Square, main square in Bishkek, Kyrgyzstan. 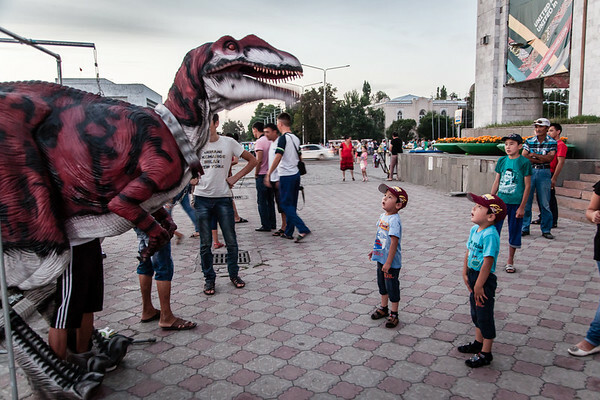 The square is full of small attractions for the kids, for example this dinosaur, that manages to capture kids’ attention. 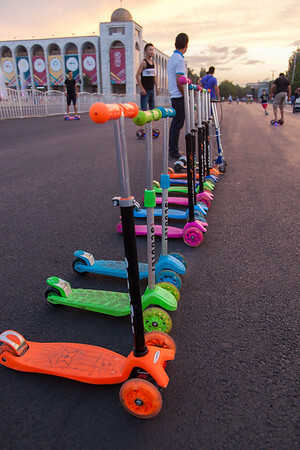 A very popular entertainment is to rent different toys and devices, from skates, to bikes, golf carts or even horse carriages. 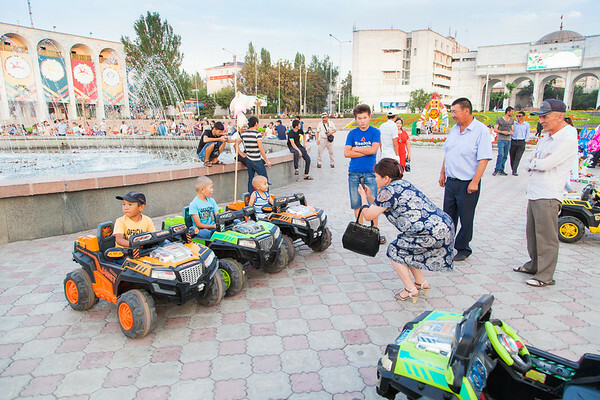 Here rental of electrical cars for kids. 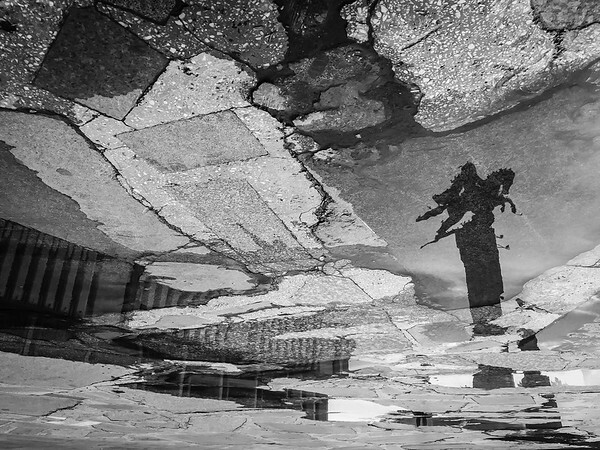 Ala-Too Square. A very popular entertainment is to rent different toys and devices, from skates, to bikes, golf carts or even horse carriages. 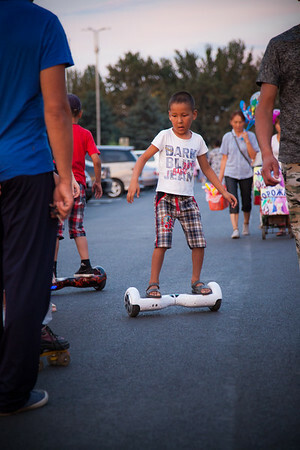 Here scooters and the newest sensation: hoverboards. A ride of 10 minutes costs 100 som, around 1,30 EUR. A very popular entertainment is to rent different toys and devices, from skates, to bikes, golf carts or even horse carriages. Here, scooters in line waiting to be rented. 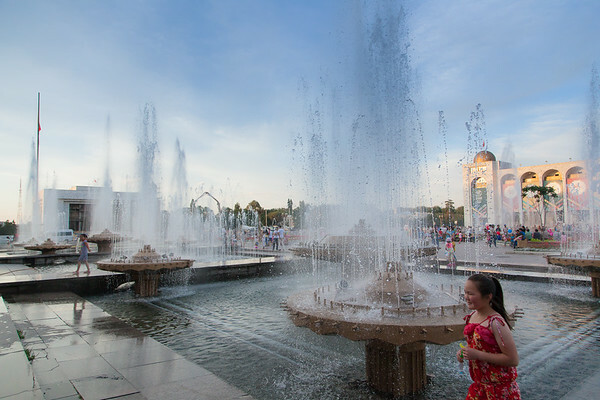 The main attraction in Ala-Too Square is probably the group of fountains located on one side of the square. 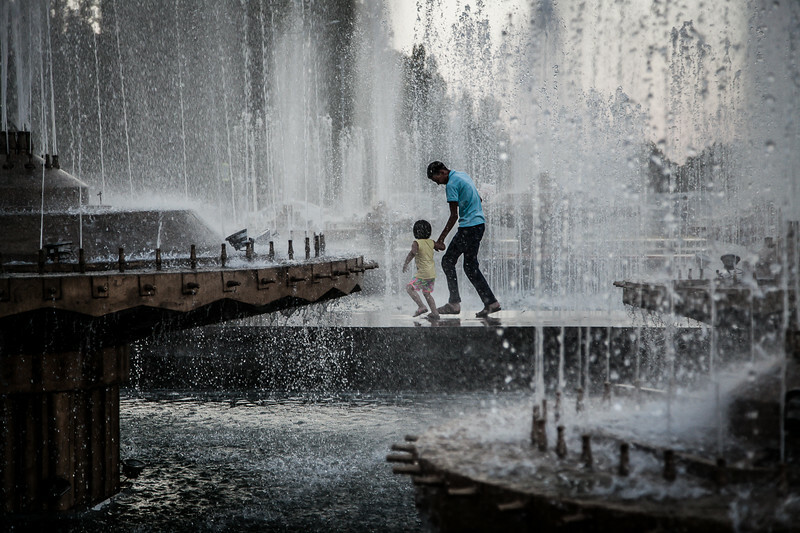 On hot summer days, kids love running under the splashed water, taking adults with them. 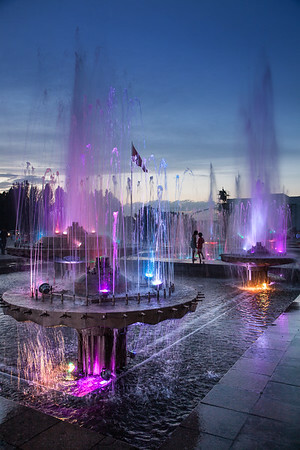 The main attraction is probably the group of fountains located on one side of the square. 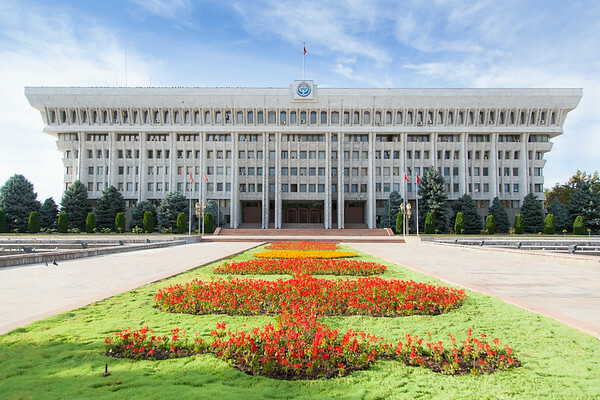 The White House, the presidential office building in the capital city of Kyrgyzstan, Bishkek. 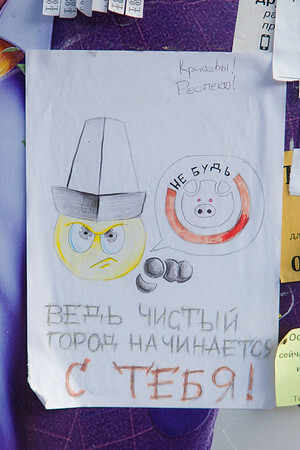 The White House was the site of riots during both the 2005 Tulip Revolution and the 2010 Kyrgyzstani riots. During the 2010 riots a fire broke out and damaged portions of the building and destroyed the hard copies of many government records. Built in Stalinist modern style. Example of communist architecture. Part of Ala-too Square. Advertisement for the World Nomad Games, that would take place just weeks later, at Cholpon-Ata resort town on the northern shore of Lake Issyk-Kul. Very unfortunately I couldn’t stay long enough to watch them live. 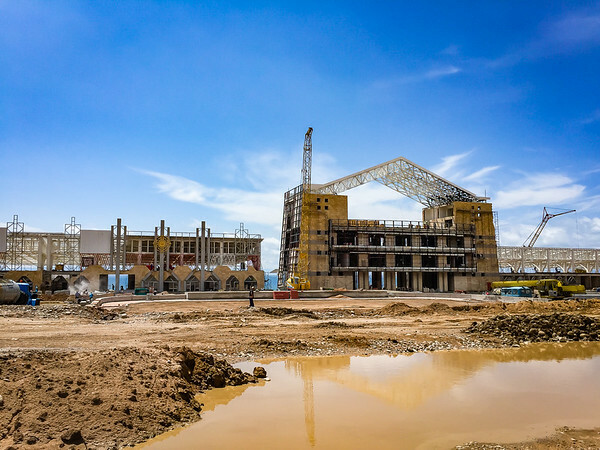 Just weeks before the opening of the World Nomad Games, this was how the Hippodrome -main venue during the Games- looked like. But like in many Olympic Games, somehow constructions work were done on time, at least enough to be able to celebrate the event. Kyrgyz government intend to hold the Games on annual basis from now on (this year was the second edition), so the enormous economic investment hopefully won’t be futile. 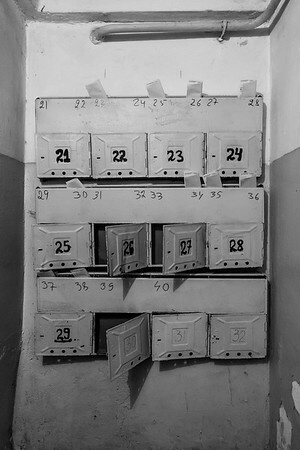 Mail boxes at a block of flats. 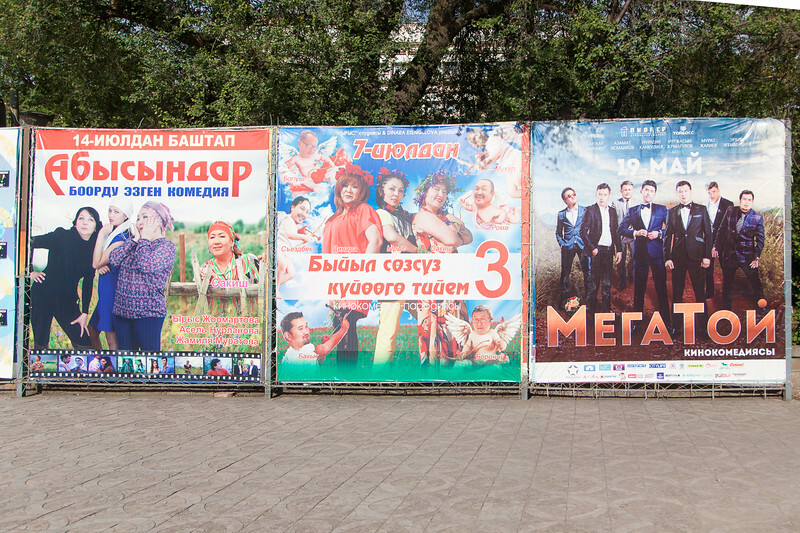 Difference between Hollywood movie posters and local Kyrgyz movies. Getting cool down at the statue of Manas. Trolleybus stop at downtown Bishkek. Squatting is extremely popular and you see people squatting every where. While waiting on the street, but I also saw people squatting while working (depending on the job, obviously). Apparently it has its origin from the nomad times: For centuries Kyrgyz were living in tents (called yurts, pictures coming soon) and so they basically didn’t have any furniture, including no chairs. Nowadays it’s more of a sign indicating rural or low class origin. 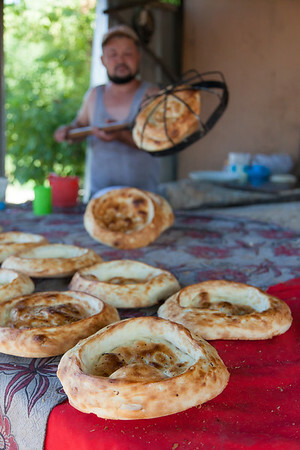 Bread maker on the outskirts of the capital Bishkek. The Kyrgyz people shows hospitality, but on my Western eyes also a bit of naivety/innocence. After taking his pictures, he insisted on giving me the bread for free, and refusing would have been offensive to him. This bread is called Nan or Lepeshka.